The go-live of a new Inventory Management system in Royal Cornwall Hospital’s (RCH) Cath Labs, marked the first step in what will be a dramatic transformation to how the Trust manages inventory as part of the Scan4Safety Programme. As one of only six demonstrator sites in the country, RCHT is leading the way for the NHS in adopting smarter and more effective systems and practices, intended to improve patient safety , save patient and staff time and reduce costs – win / win for all. Using simple point and click scanning, the system holds data on what implant has been used for which patient, allowing staff to quickly and safely track down any products in the event of a product being recalled for safety reasons. 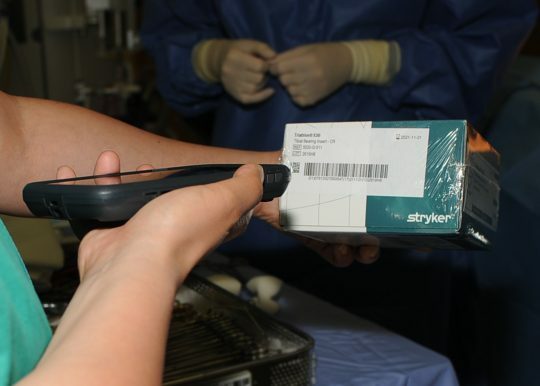 The new Atticus system uses GS1 Barcodes and ‘hands free’ RFID tags to track what stock we have and what we are using, making sure everything is in date and we can find what we need for our patients at all times. By automatically re-ordering what we use, clinical teams will no longer waste time on ordering. In the Cath Labs alone, this has been calculated as 25 hours per week extra to spend on improving the quality of patient care – the equivalent of 3 days of a full-time clinician.